I know this sounds stupidly obvious, but if you don't know how your series is going to end yet, this is where you stop and figure that out. Stories that don't know where they're going tend to meander, which leads to flabby storytelling and boring, pointless chapters. It's much easier to write high energy, competent, clear prose if you know where you're writing to, and that means knowing the ending ahead of time. You don't have to know all the details yet, and none of this is set in stone. Until you're actually at the final book, you can always change your mind about the ending so long as you don't contradict what you've already written. That said, you need to have some idea of where your story is ultimately going, preferably from book one. Even if you ultimately change your mind, just having an end goal you can keep all your books aimed at makes you look like a super smart, competent, together author who had this in the bag the whole time. That's never a bad thing, especially since this sort of planning is the first step toward actually being that author. Now that you've got your ending, it's time to figure out how you're going to get there. Again, this is very big picture plotting. We're not worried about the details. All we're doing at this point is trying to come up with a basic route between where your series starts and where it ends. How do you do this? Well, when I'm planning this route for my books, I try to think in terms of escalating action. For example, in my Eli Monpress Fantasy series, I knew I wanted to start on a kingdom scale and end with an epic battle for the world. To avoid jumping straight from local troubles to epic battles (which is very jarring), I knew this meant that each book in the series would have to get one step bigger both in terms of the world and the stakes. This "one step bigger" power curve approach works really well for series since readers expect each book to top the last. If you have your heroes saving the world in book three only to hang up their epic weapons and go back to their hometown to solve a local mystery in book four, it doesn't matter how interesting that mystery is, the story's going to feel small and pointless by comparison. With that in mind, you want to approach this filling in between book 1 and book the final like the whole series is one big story. This overarching story is called the Meta Plot, and we'll talk a lot more about it in the next installment of this series. For now, though, the best way of thinking about it at this point is to try and see your series as a whole rather than individual books. Every event or battle or conflict you put in your early books should have ramification and consequences throughout future ones. Likewise, your characters should grow and change from book to book. Since we've already got our ending (and hopefully our beginning) at this point, all we're really doing here using this growth curve to color in the middle. Look at where your characters and world start, and then figure out what has to happen to transform all of that into the people and situation you've come up with for your ending. Not knowing your book or characters, I can't tell you exactly how to do this step. The best I can suggest is to focus on creating a natural progression. If you've got nothing else, just go to the ending you already worked out and take a step backwards. How did this ending come about? How did your characters get here? When you figure that out, step back again. Likewise, you can go to where you want to start your series and ask "what are the consequences of this book? What happens next?" Nothing in a plot happens in a vacuum. Everything your characters do has ramifications. If you follow the natural fallout of those events while simultaneously angling events toward your planned ending, your meta plot should emerge naturally from the chaos. And once you've got that, you've got the meat of your series. Now that you've got your general plan for getting things from Beginning to Epic conclusion, it's time to break out the individual books. There are any number of ways to do this. The easiest and probably most natural way is to plan on one book for each major event in your meta plot. For example, if your meta plot has your characters saving the kingdom, raising an army to defeat the legions of darkness, and then finally marching on Mount Doom to defeat the villain once and for all, each of those steps would be its own book. Note the escalating scale: first a battle for a kingdom, then kingdom vs. kingdom, and finally a full scale invasion. Now, of course, there's going to be a LOT more than just the above going on in each book, but we don't need to know that right now. Remember, series planning is big picture! We're just trying to get the arcs of the story in our heads. So long as you know the major conflict for each book and how that book moves the greater meta plot of the series forward, you're good. If your story isn't the sort that neatly breaks into escalating steps, you can also divide your series by characters. I did this in my Eli series, using the first novel as an introduction to the world at large and then focusing the plots of each subsequent book on a different character's problems and backstory. To make sure my books escalated properly, I started with the character who had the simplest arc and the least to hide (Miranda in The Spirit Rebellion) and ended with the character who had the most complex arc and the most to hide (Eli in Spirit's End). For a character heavy series like Eli, this system worked really well. All the characters and the larger meta plot still got development in each book, but the character whose "book" it was got to be the star and I got a whole book to specifically explore their area of the larger world, be it Miranda and her spirits, Nico and her demon, or Eli and the Shepherdess herself. The result was a character centered series where everyone got a chance to shine. How ever you decide to break up your series, the most important thing is that each book have a self contained narrative with its own plot and climax. Even in an extremely long running series, you never want to have a book that's all middle At the same time, though, you never want to have a book that's too self contained. If you tie off all the ends, get all the couples together, and give your reader a nice, neat closure, they have no burning need to go read your next book, and that's not what you want. You don't have to end on a cliff hanger, but ever book in your series should leave your reader salivating for the next one. At this point, you should have a basic idea of how many books your series will have and what happens in them, so the next step is to expand that into a short summary. Please note that this is not a plot. We're still not sweating the details at this stage, but this is where things do get more specific. Now that you know the big meta plot step of each book, you want to start figuring out what the actual story surrounding that consists of. Personally, I focus on the big stuff: where the characters are going in this book, what they do there, what's the climax, and where are they when the book ends. I also keep a firm eye on where this book fits into the series as a whole. This is important for making sure whatever events I plan fit into the escalating power curve of the series and the character arcs. On a more fun note, this is also the stage where I try to envision all my books as they'd appear on the shelf. I dream up covers and play with titles, whatever it takes to get a concept of each book as a separate whole in my head. Again, you don't need plots or even detailed events, you're just figuring out the basics of what happens each step of the way and how each book advances the meta plot of the series and the lives of the characters. This is also the step where you really want to keep your audience in mind. They're the ones who are going to be reading these books. You want to make sure that each book you plan flows neatly and logically into the next one. If you plot has you making a big leap in time, make sure you think about how you're going to deliver that information to your readers, and if they're going to receive it well. If your series starts as a high school YA, but then you decide to make the final two books happen 20 years in the future when your characters are in their 30s, that's not going to be an easy sell for your audience. I'm not saying you can't do it--you're the author, you can do anything--just that it's not a decision you want to make without serious consideration of who your readers are and what you're selling them. I know managing expectations doesn't sound like fun, but readers are the reason we have the writing business to begin with. Ignore their wishes and comfort at your peril. The ultimate goal of all of this is to end up with a series of proposed books that your and your reader are both dying to read. But while we are making real plans for what's going to go down in each book, even this step is still very up in the air. Just speaking personally, I have never had a finished book that completely matched the summary I wrote out for it at this point, and that's okay. These things should change, because you're learning and getting better at your series as your write it. The point here is to build yourself a starting platform, something concrete you can jump off of for each book. Even if you end up throwing it away, just the act of thinking about how each book will go will make your series more real in your head. Now that you've got your general book summaries, it's time to make sure your characters are changing in time with your plot. If you read my post about writing character driven plots, you've probably been thinking about this the whole time, but just in case you haven't, this is the step where you're going to want to figure out how your main cast grows and changes over the events of the series you've just planned out. Just like the overall series power curve, character changes should be gradual and happen in natural steps that reflect the events of the books. If you need a character to have a great epiphany or change from a coward into the warrior who's going to save the world, that's a big plot event and should be treated accordingly. Remember that you have your whole series to get your characters into their final forms, so don't be afraid to break their growth up into many smaller steps that fall all throughout the books. Fit that character growth in wherever possible. Just make sure you have a plan for where you're going so you don't waste time growing your character in the wrong direction. Again, it all goes back to Step 1: knowing your ending. So long as you've got your eyes on that prize, you will find ways to put your character through just the right kind of hell to make sure they come out as the hero, or villain, you need for your ending. If you've made it to this point, congratulations! You've got everything you need to start your series! These are just the basics, of course. We'll get into the finer points of how to manage your series once you're actually knee deep in it over the next two How To Plot a Series posts (a series on series! #youseewhatIdidthere?). For now, though, I hope my list helps get your own series ideas straight in your head for the production of many amazing books. See you all next week for another Writing Wednesday! Until then, thank you for reading, and as always, happy writing! Thank you for adding the other retailers. I hate having to read on the kindle app. Picked up the ibooks copy. I do love series, but I also hope they have an ending. Once authors start getting between 10-15 books, I grow bored...even with authors I adore. I love reading about new worlds and wish some authors would wrap up their series and start another one. You can never have too many imaginary worlds. 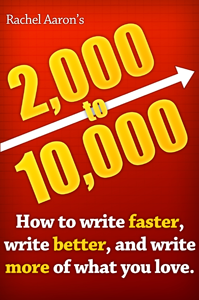 It's amazing how many authors have heard of and read 2K to 10K. I read it a year or so ago, but haven't given your method a real, solid try. Need to do that ASAP, b/c I so need to be a faster, better writer. I've pantsed all my books so far, and I can't help but feel that there's a better and faster way to get to The End. Perfect timing for me as I am trying to organize and create a series. This will be very helpful. Thanks! I absolutely LOVE 2K to 10K! I just started skimming over the "Editing" section again yesterday and am about to start reading it for the second—definitely not the last—time. Rachel's ideas on editing really opened up a new can of worms for me and helped me realize that editing doesn't have to be a linear (beginning of book to end) process. Rachel was the first person I really found who advocated plotting for faster writing. Ever since then, I've found many other well-known, self-published authors who do the same thing. I haven't found my personal groove yet (I've only written a few short stories and just finished my first novel recently, plus I'm constantly experimenting with writing methods), but I definitely keep Rachel's ideas in mind when writing. Definitely give her book a try. I'd pay $5.99 if I realized just how helpful this book was before buying it. .99 is a STEAL! Hi Rachel - I'm new to your blog and have been gobbling up quite a few of your posts in the last couple days. I found you through Ruth Harris' post about speed writing this week on Anne R. Allen's blog and I'm so glad I did. I've learned a great deal from your blog already and this post is no exception. I bought your 2k-10k book and am reading it now as well. Thank you for sharing your experience and expertise with us. Now I'm off to read your second post in this series about writing the series. Much appreciation, Rachel!